Merlin Project Express: explore a smart project app to manage all your to-dos. There aren’t many true “details people” in the world. Sure, a few of us memorize dates with ease, never forget a face or a name, and can remember what they had for breakfast two days ago. Merlin Project Express gives that level of control to the rest of us. This flexible, robust project planning app is built to support even the most complex tasks, whether for work, hobbies, or event planning. With an interface that breaks down broad-strokes goals into specific action items and attaches useful information to each one, you’ll never be unsure of what’s next and who’s responsible. Plus, with powerful analytic tools you’ll gain new insights into your project even as you plan, helping you avoid snags before they happen. Here’s how to make the most of it. The app lets you build custom projects from scratch, or choose from pre-made templates. If you plan a lot of the same type of project or event, you can easily save a customized format as a template to return to. Your project is represented as a timeline composed of individual activities. 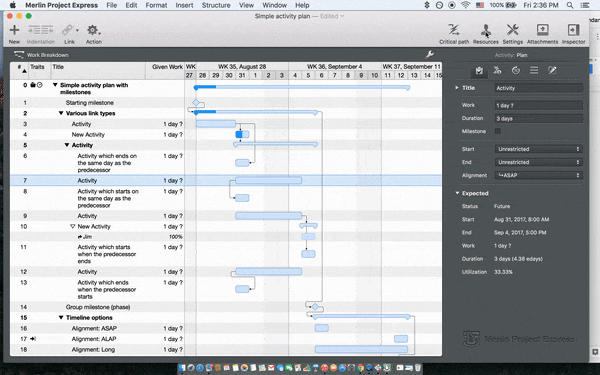 In project view, you can see the whole flow of a project over the course of days and weeks. You can also set the overarching conditions of your project using the “settings” tab. The backbone of the app are discrete tasks called activities. These appear as small boxes on the timeline, but they be loaded with a surprising amount of information. You can assign people and materials to them as “resources,” set dynamic start and end dates, attach files, and mark them complete, all through the “action” menu. By adjusting the indentation of activities or creating special types like “predecessors” and “successors,” you can create smart representations of interlinked tasks. A big part of making a project go right is knowing who’s responsible for different tasks. The “resources” tab lets you create profiles of the people involved in the project, such as employees, contractors, service providers, and regulators. Other types of resources include materials, companies, and equipment. You can load details about each resource to their profile and attach any relevant files. When you’re ready, you can assign them to activities in a snap. If you choose to log information about your project budget and expenses at the activity level, the app can help you keep track of the financial health of your project. The “Finance” tab shows you the budget, cost, and balance of each activity, or of the project at large. The “Actual Values” tab next to it can give you an at-a-glance sense of how much work you’ve completed. With these tools, you’ll be able to make more informed decisions about how to proceed and adjust your plans. The more information you put into Merlin Project Express, the more it can do for you. By keeping the relevant details of every person, company, and dollar involved in your project in one place, you’re setting yourself up for organizational success – even if you’re the kind of person who routinely forgets their keys.